I think this applies equally to both men’s and women’s closets — while I am a huge fan of mixing and matching patterns, there is a wardrobe staple that has to be mentioned as the foundation of a well-dressed person’s wardrobe: a perfect white shirt. Some may find it “too easy,” clichéd, or even uninspired to choose a solid white broadcloth shirt when there are far dandier choices to be had — a veritable Gatsby’s closet of stripes, checks, plaids. Maybe it’s my current obsession with a television show, of all things. 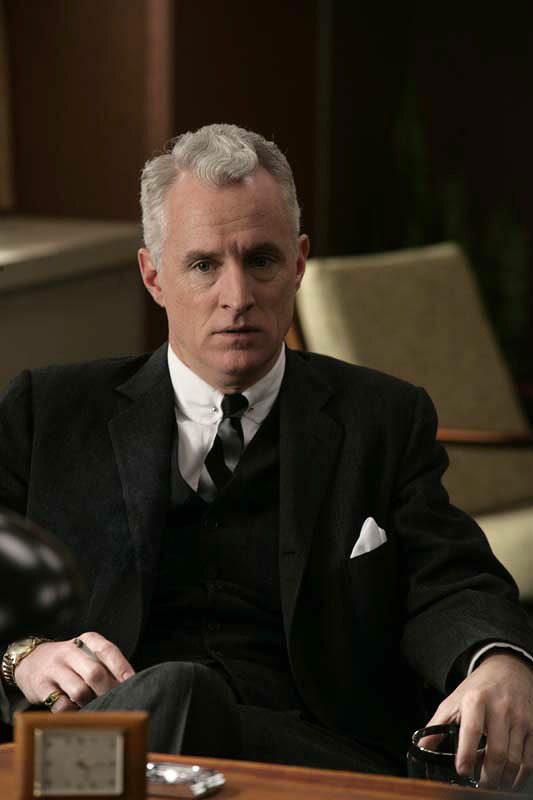 AMC’s “Mad Men.” Take a look at John Slattery, as Roger Sterling. Crisp, right? Plays nicely against his silver hair and dark suit. You tell me, but I think he looks better all pinned and proper. John Hamm, who plays protagonist Don Draper, is equally well-kitted out in his spread collared, french-cuffed, perfectly pressed shirts. 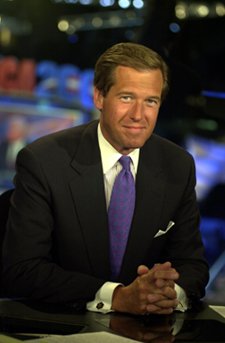 Brian Williams has made the shirt his uniform. Selecting a tie is easy on the completely neutral ground of white. Everything works. But I prefer a metallic woven — the “wedding tie,” for example — with a charcoal suit. All the better to channel my inner Cary Grant. Or choose a solid navy grenadine to go with your navy double-breasted suit. High contrast can work wonders. Women wear open necked shirts, for the most part. Perfect accessories pop when paired with the right white shirt. A colorful scarf, a triple strand of pearls, a diamond solitaire, a silver — or even velvet — choker. Chosen carefully for fit and construction, white is always right. Ask Ms. Hepburn. This entry was posted in Elegantology and tagged clothing, Elegantology, shirts. Bookmark the permalink. 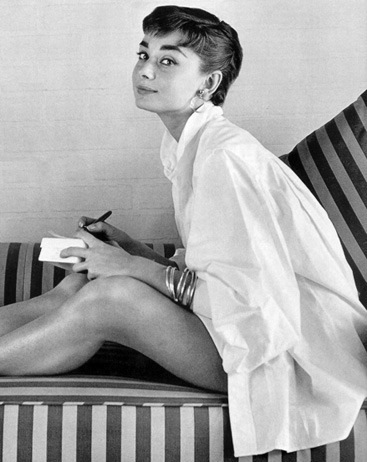 How gorgeous does Audrey Hepburn look in this crisp, white shirt! As a plain jane in the fashion department, this is one of my favorite looks–with jeans of course. Will add the white shirt to the pile of ironing…. Love white shirts! Do you know the store Anne Fontaine – all white shirts for ladies – tres french and wonderful. BA- plain doesn’t rule out elegant (as you point out in Ms. Hepburn’s case.) Beau Brummel was a very plain dresser. Just perfect in every last detail. As I’m sure you are. Mrs. PVE, the store sounds perfect. I will have to sneak over, if they have an online presence, and furtively send a few Mrs. E.’s way. She hates it when I shop. Thanks for the tip. Old Brian’s looking a leeeetle too tan there. It looks kinda strange! That third coat gets you every time. Having said that, I aspire to Hamiltonian hues. As in George. I love the look of a crisp white shirt but sometimes I wonder if I can carry them off without a sweater or very bright tie as I have such pale skin. White shirts definitely work better on a tanned complexion! You might be disappointed to learn the bulk of my wardrobe is black and white. And the white shirt? A staple. The Brooks Brothers no iron has saved me many a day as I’m dashing out the door. Mrs. B, not at all…. even my favourite movies are in black and white. Good hint at the shirt for me… “no iron” has a nice ring.. This post is perfectly timed, as I only last week picked up two more perfect white shirts, as I can’t seem to have enough of them in my closet. They seem to work effortlessly with a cashmere cardigan and a long necklace for the office, or a dinner jacket and silk scarf for evening. Is there a place for plus sized ‘perfect elegant white shirt’? Dear readers, please provide your solutions. This is important! Elegant cuts should be available to all. And I should add: none of us is perfect. Me, as I’ve written, I’m part corkscrew. I think that Land’s End does a very good job with a quality garment. I once had a dry cleaner tell me that they had some of the best buttons in the industry. Audrey is just the cutest, bare none. always. 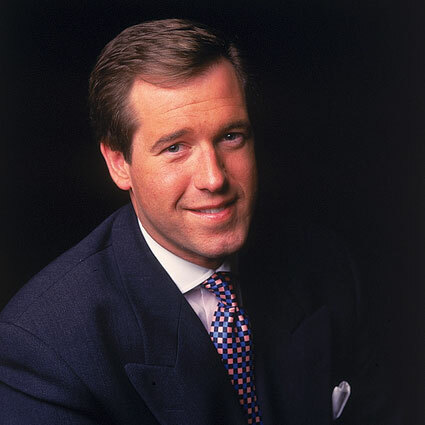 And Brian Williams – never saw him look bad, ever.